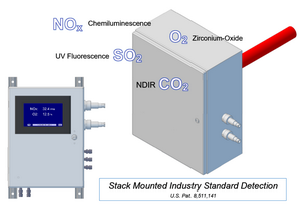 Our Model 9705 Process Gas Monitor for monitoring NOx, SO2, CO2, and O2 (any two gases). The Model 9705 can be used specifically as an SCR NOx Monitor for real-time control of ammonia injection or other process control applications that require fast response time and continuous measurement of NOx and oxygen in the presence of ammonia. The only line of NOx analyzers and oxygen analyzers specifically designed for low-NOx gas turbine applications. Brand-Gaus gas analyzers feature an industrial interface and solid-state detection, making them clear choice for gas turbine CEMS. Our NOx analyzers utilize next-generation chemiluminescence technology for greatly improved reliability and stability. Our O2 analyzers utilize our innovative linear output zirconium oxide cell for measurement capability at zero concentration, making Brand-Gaus oxygen analyzers ideal replacements for paramagnetic and conventional zirconium oxide oxygen analyzers.